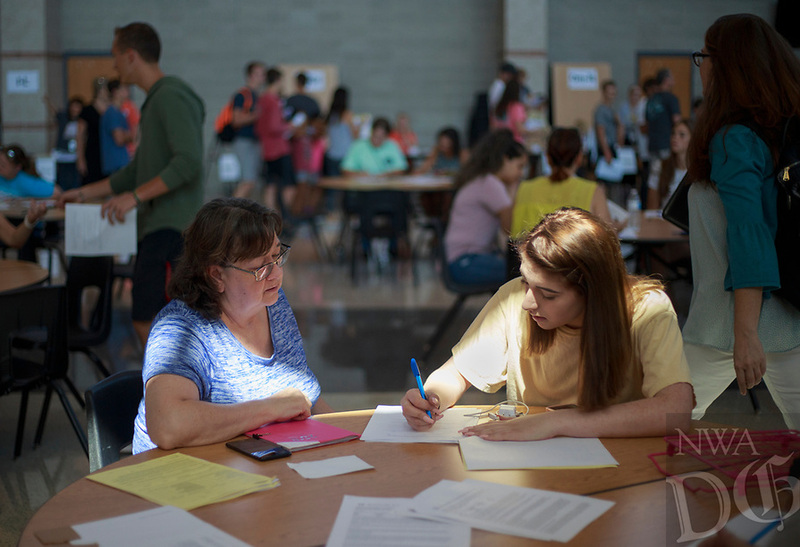 NWA Democrat-Gazette/CHARLIE KAIJO Stephanie Wendell of Bentonville and Dawn Wendell, 16, fill out school paperwork during an open house, Thursday, August 1, 2018 at Bentonville High School in Bentonville. The Bentonville School District is issuing Chromebooks for students to take home for the first time. They are one-to-one throughout the district but at the high school level, grades 9-12, they can take them home, use them in the community, public library and bring them back to the school to use. More and more, students are using "tech books", meaning e-books. Students can access their tech books online, containing information that would have been in text books in the past. "ItÕs a life skill at this point to be able to learn in a blended environment where some of the curriculum research and books are online and some may be face to face in person," said Jennifer Morrow, executive director of secondary schools." ItÕs a tool to help us do our work in a more paper free environment." The district is distributing 5,000 Chromebooks. Of those who have up theirs, 1,208 have been distributed to Bentonville West High School. They expect about 2,000 in total there to be distributed. Bentonville High School expected to distribute about 3,000 on Thursday.